I find it hard to believe BB will want to bring back someone as unreliable as Gordon. Don't waste reps and time with Gordon when you know he's going to screw up again and get suspended. Give those reps to someone that can be developed and counted on. He was only brought in this season as a last resort, desperation move when it became obvious our offense had no firepower. Gordon let his team down, just as he's done countless other times. On the other hand, it's hard to turn down a big deep threat WR who is ridiculously productive and can be had for good value. He fills a need for the Pats offense, and with more chemistry and time to learn the offense he could be even better next year. Gordon can produce like a #1 WR but next year he will get paid pennies. Talents like Gordon don't grow on trees and Belichick will find it hard to resist bringing him back. In just 12 games, while learning on the fly, Gordon had 737 yards and was getting better and better as the season went on. He averaged 18 yards per catch which was one of the best in the entire league. IMO the best scenario is bringing Gordon back on an incentive based contract but also preparing to play without him. Draft a couple WR's in the early rounds. 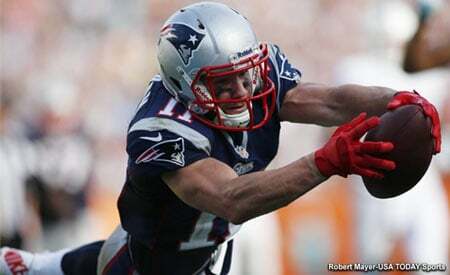 Bring back Amendola. Even if we just get another 10-12 games out of Gordon, can you even be upset when you consider he's making less than every other WR on the team? I don’t think they’ll depend on him, but I think they’ll keep his rights. He’s got a ton of talent. Can a mod please move this to the main forum? I kinda doubt it. He seems like a pretty self-aware person. And his problems seem to be exasperated by football and the whole culture around football. So I think he just might try to stay away to keep focusing on himself and keeping himself in check. Yes. Once he is reinstated, we might get a full season out of him. They will keep him. He has a terrible demon that he's fighting with. Its obvious the players care about him and he cares about the team. I think the whole locker room is rooting for him to beat his demons and i hope this latest stint in rehab will help the most. He was slowly starting to get his speed back and looking better as each week went on, so i hope he can become the player we all know he can. Can I see a link?? Very interesting. I would say Four Games the most with time already served counting last season. Seems like Gordon is out of rehab and is at TB12 centre according to his Instagram. Can only take that as good signs. For his sake I hope he’s found some coping mechanisms, for his demons he’s suffered with. Also looks good for us going forward.